The Grand Canyon is listed by UNESCO as a World Heritage Site since 1979. The first people living in the Canyon were the Paleo-Indian (ancient Native American peoples) 12, 000 years ago. They left behind stone tools. Tourists started visiting the Grand Canyon in the late 1800's. The Grand Canyon is a steep-sided canyon carved by the Colorado River in the state of Arizona in the United States. 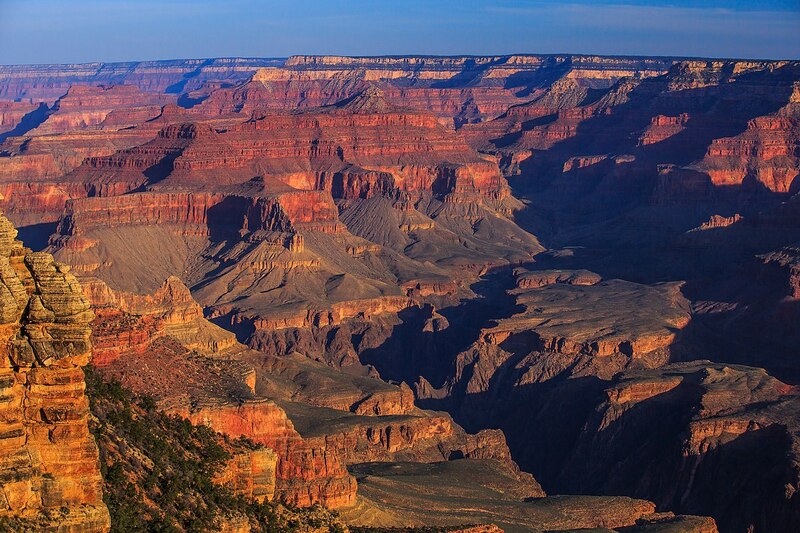 The deepest point of the Grand Canyon is just over a mile deep. The Grand Canyon is 446 kilometers (277 miles) long, up to 29 kilometers (18 miles) wide and attains a depth of 1,800 meters (5,905 feet). The rocks of the canyon contain fossils of plant and animals. As we hike down the canyon, the fossils in the rocks get older. Studying these fossils tells us about the animals and plants that lived there millions of years ago. At its narrowest, at Marble Canyon, the Grand Canyon is only 548 meters (1798 feet) across. In the last ice-age 11,000 to 80,000 years ago, animals such as Woolly Mammoths and Giant Sloths standing 12 feet tall lived in and around the Grand Canyon. Their bones have been dug up in caves of the Grand Canyon. Around 20 million years ago the Colorado River begins to carve into the Grand Canyon at its eastern end, Marble Canyon, and probably exiting via Kanab Canyon. At 17 million years ago the Colorado Plateau begins to uplift and causes the river to cut deeper. The North Rim gets more rain and snow melt, making the canyon on the North Rim more jagged and steep. The three main types of sedimentary rocks at Grand Canyon are sandstone, shale (or mudstone), and limestone. Metamorphic rocks are rocks that have been changed under great heat and pressure. The original rock can be sedimentary, igneous, or even metamorphic. Geologists are drawn to the record of Earth’s history contained in sedimentary rocks blanketing the Vishnu schist. The first Europeans to visit the Grand Canyon were Spanish and they arrived 473 years ago. The North Rim of the Grand Canyon at an average height of 8,000 feet is higher than the South Rim by 1,000 feet. The Cohonina people lived in the Canyon 1,500 years ago and grew food such as corn and beans, hunted for food and gathered edible plants. They also made pottery and weapons and these are found buried in the caves in the Canyon. As we go down into the Canyon the rocks get older. The bottom rocks are the oldest 1. 84 billion years old (1 864 000 000 years old). The rocks at the top of the plateau are the youngest at 270 million years old (270 000 000 years). The rock found at the bottom of the Grand Canyon (Vishnu schist) is close to 2 billion years old. Throughout the 1800's pioneering farmers, ranchers and miners came to the area. The condors were reintroduced to the Grand Canyon in 1996. Today there are 1, 500 different plants, 355 different birds, 89 different mammals, 47 different reptiles, 9 different amphibian and 17 different types of fish that live in and around the canyon. Some are found nowhere else in the world. Being desert country it doesn't rain a lot. Few plants can live there to keep the soil and rocks in place. When it rains and the snow melts, the water washes away more rocks and soil, making the canyon deeper. More than 5 million people visit the Grand Canyon every year. John Wesley Powell led the first expedition down the Grand Canyon in 1869. He was the first to use the name “Grand Canyon” after it had previous been known as the “Big Canyon” or “Great Canyon”. Grand Canyon was officially designated a national park in 1919. Animals that live in the Grand Canyon include Coyotes, Squirrels, Raccoons, Bobcats, Mountain Lions, Bald Eagles, Chuckwalla Lizards and the Diamond Back Rattler snake. The Ancient Pueblo people built stone villages within the Canyon 1,000 years ago. Since that time other Native American people have continued to live around the Canyon area = such as the Navajo (Dine`), Hualapai and Havaupai tribes. The park includes over a million acres of land—(1,218,375.54 acres; 493,077 hectares, to be exact; or 4931 square kilometers; 1,904 square miles). Grand Canyon National Park is the United States’ 15th oldest national park. In 1979, UNESCO declared the park a World Heritage Site. Grand Canyon is one the “Seven Natural Wonders of the World”. The Grand Canyon is 277 miles long located in the state of Arizona. Though widely considered one of the world’s most spectacular canyons, the Grand Canyon is neither the world’s longest or deepest gorge. In 1994, the Guinness Book of World Records crowned the Yarlung Tsangpo Grand Canyon in the Himalayas as the world’s longest and deepest canyon. Its depth reaches 5,382 meters (17,567 feet) and its length 496.3 kilometers (308 miles). Grand Canyon is an extremely popular tourist destination with around 5 million visitors enjoying its immense beauty every year. The animals and plants live in different places in the Grand Canyon. On top of the North Rim, evergreen trees such as pine, spruce grow because it is cooler and wetter. On the South Rim which is warmer and drier, Ponderosa Pine, Oaks and Juniper woodlands grow. Within the canyon itself, it is hot and dry so Cactus plants grow there. Willow and Cottonwood grow along the river banks. Aside from sightseeing, hiking and rafting are also popular in the area. The South Rim averages 7,000 feet in height and people can visit there all year round. It is drier and warmer than the North Rim. Its slopes are not so eroded and easier to hike down. President Theodore Roosevelt visited the canyon in the early 1900's. He pledged to preserve this special place for future generations. In 1908 the Grand Canyon became a National Monument and then in 1919, President Woodrow Wilson turned the Grand Canyon into a National Park.